The end of summer is near. As much as that is a bit saddening, I think most of us Wisconsinites look forward to the upcoming fall and winter seasons. I know I do. I will miss the nightly grill sessions, the full day of smoking meats, and some of the foods that define summertime such as corn, burgers, and delicious salads. As much as I will miss these meals, I also look forward to fall time meals such as soups and hearty stews. Summer is not over though. Granted, we are having some fantastic weather in Wisconsin where it is sunny and in the mid-seventies, but the grill is still fired up, and those things such as grilled corn, and potato salad are still flowing. It’s our way of holding on before we are bundled up in our jackets, and shaking in our boots to stay warm. 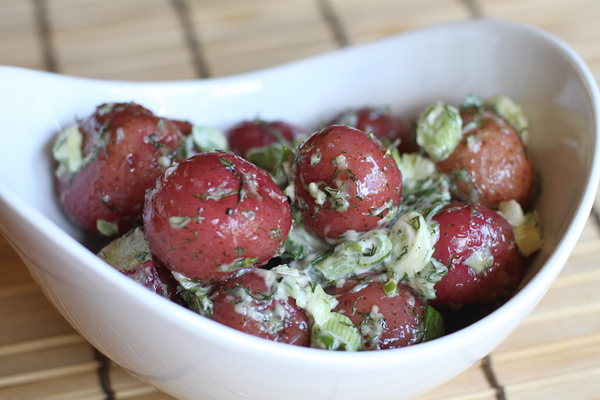 With that said, I bring you this potato salad that was the perfect side dish to, well, pretty much anything. Now I have made some pretty fantastic potato salads, and I know everyone simply loves my mother-n-law’s version, but I came up this dill and garlic potato salad that simply blew me away. To say the least, I thought it was something wonderful. A great garlic punch is balanced out by the dill and scallions and some creaminess from a touch of mayonnaise. Enough said, let’s get started. This potato screams summer, and again, it is packed with this bright garlic and dill flavor that just opens your palette. Start by bringing a large pot of water to the stove. Add in the potatoes, whole, and bring it to a medium-high heat. During this time, Add the remaining ingredients to a mixing bowl. When the potatoes are for tender, remove them with a slotted spoon or cooking spider and add them directly to the mixing bowl. Once they are all added, gently toss to cover each of the potatoes. Plate in a nice serving bowl and dig in. The end result is a thing of beauty. You get these super tender potatoes that are coated with this amazing dressing. When cutting into them, or forking for that matter, you get the great flavor on the exterior while the interior remains soft and creamy. It’s a perfect balance to end any summertime meal. Hope you enjoy.